The Yellow-bellied Flycatcher is a regular, but rare migrant across Tennessee, and can be identified most reliably by its song, though even that might be confused with the song of a Least Flycatcher. Flycatchers in the Empidonax genus are notoriously difficult to distinguish from one another, and the Yellow-bellied Flycatcher is no exception, though it does tend to be more yellowish below than the others. It breeds in the Canadian boreal forest swamps and bogs, and winters in a variety of mostly moist forests from southern Mexico through Central American. This bird is most likely to be found in Tennessee from mid to late May during spring migration, and from late August to late September in the fall. Description: This small flycatcher has a large, slightly crested head, a bold, complete eye-ring, is dull olive above, and is yellow-olive below with a somewhat darker breast-band. It has two broad whitish to yellowish wing-bars, and both male and female look the same. Voice: The song is a hoarse che-lek, similar but lower and softer compared with Least Flycatcher. Empidonax flycatchers all look similar and are best distinguished by voice, though the Yellow-belled Flycatcher tends to be more yellow below than any other Eastern Empidonax. 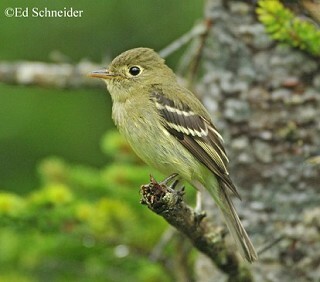 Habitat: During migration, the Yellow-bellied Flycatcher is often found low within shady woods. Diet: Mostly insects, some berries in fall. Nesting and reproduction: Not known to nest in Tennessee. On their breeding grounds, they nest on the ground, typically in wetlands and bogs. 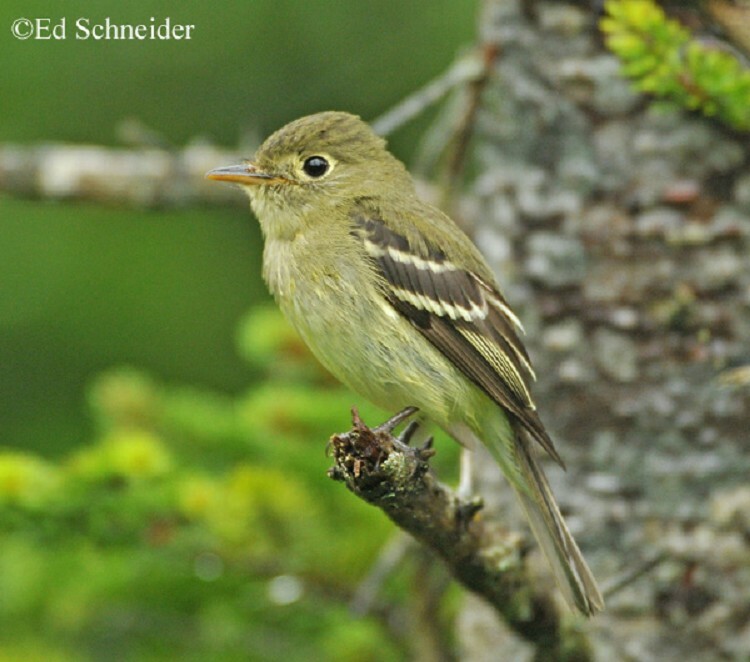 Status in Tennessee: The Yellow-bellied Flycatcher is a regular, but rare migrant across Tennessee, most likely to be found in spring from mid to late May, and from late August to late September in the fall. The Yellow-bellied Flycatcher was first described in 1843 by Spencer Fullerton Baird (1823-1887), an American ornithologist inspired by John James Audubon. During the non-breeding season, the Yellow-bellied Flycatcher occupies a variety of forest habitats in Mexico and Central America, including coffee plantations. As might be expected, shade-grown coffee plantations have higher densities of Yellow-bellied Flycatchers than sun-grown coffee plantations. The Yellow-bellied Flycatcher stays on its breeding grounds for a shorter period of time than most Neotropical migrant birds; often less than 70 days. Best places to see in Tennessee: During migration might be found low within shady woods and along woodland edges across the state. Radnor Lake in Nashville is a fairly reliable place to find these birds in spring migration. Gross, D. A., and P. E. Lowther. 2001. Yellow-bellied Flycatcher (Empidonax flaviventris). The Birds of North America, No. 566. (A. Poole and F. Gill, eds.). The Academy of Natural Sciences, Philadelphia, PA, and The American Ornithologists' Union, Washington, D.C.